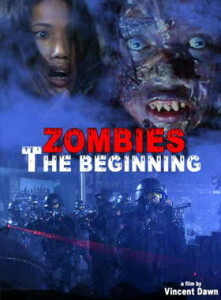 In Zombies the Beginning, you have a classic steal – the filmmakers (Italian “legend” Bruno Mattei, chiefly) took Aliens, replaced the aliens with zombies and voila, new movie! Only, not very new – we’re talking line-for-line swipes 95 percent of the time. There are a few moments of amusement to be found here in seeing how they deal, or fail to deal, with the changes necessary to realize the zombified take on Aliens. There are also a few moderately humorous lines, including the obligatory nod to George Romero. Then there are a few real WTF moments, such as the weird brain that controls the zombies, the pregnant women incubating zombie babies (which seems awfully redundant and pointless since a zombie bite appears to makes more zombies, but whatever), the weird air-conditioning ducts that lead to the pregnant women in one scene and the fucked-up zombie-hybrid naked hobgoblin children that presumably come from the pregnant ladies. 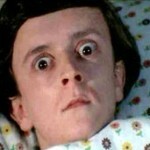 Mostly though, it’s just a dull, tepid, cheaply made Aliens rip-off that isn’t worth the time it takes to sit through. Absolutely shocking how they not lifted scene for scene right from “Aliens,” but they then literally lifted the dialogue line for line from Aliens to this movie. When the lady went to re-align the “antenna” and they asked how long it would take. I started saying out loud what bishop said in response to that. Here’s more. I don’t know what’s species are worse…you..or tyler incorporated. There’s movement all over the place….she doesn’t know what she’s saying…she’s delerious….say hello to my little friend…hey, I know you guys are all strung out and are in really bad shape but stay frosty, we can’t afford to let one of those things in here…. I say we fly to a safe distance and nuke the place from orbit. It’s the only way to be sure….to destroy this horrible film. Yes, it is an amazingly ridiculous rip-off. Bruno Mattei is an unbelievable hack. All his movies are among the worst I have ever seen, this one included, although this seems to be the most brazen rip-off. 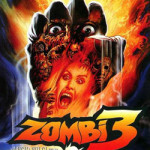 They should have called it Zombies: The Alien rip-off.